I recently hosted a pedicure party as a fundraiser for our local school, and I thought it would be fun to give the participants a little treat to take home. After a little research (hooray, Pinterest! 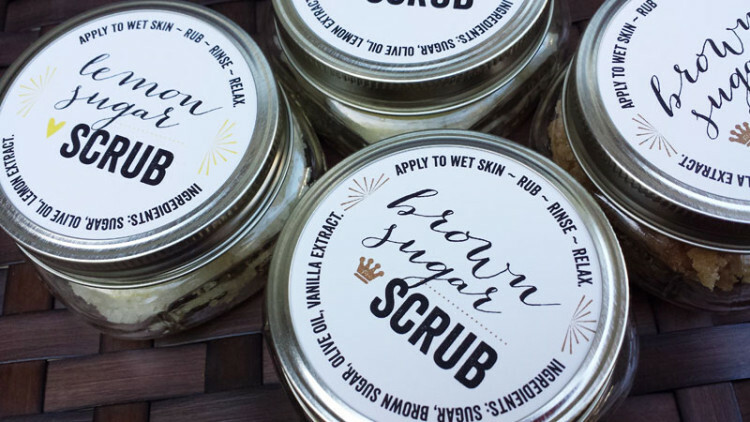 ), I made sugar scrubs for everyone and designed some custom labels for them. 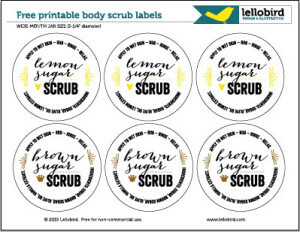 I thought you might like to have a printable version of the labels, too – they’d be perfect for goodies at a spa day or bridal shower, or as a quick gift for a friend. I tried two different recipes I found online. 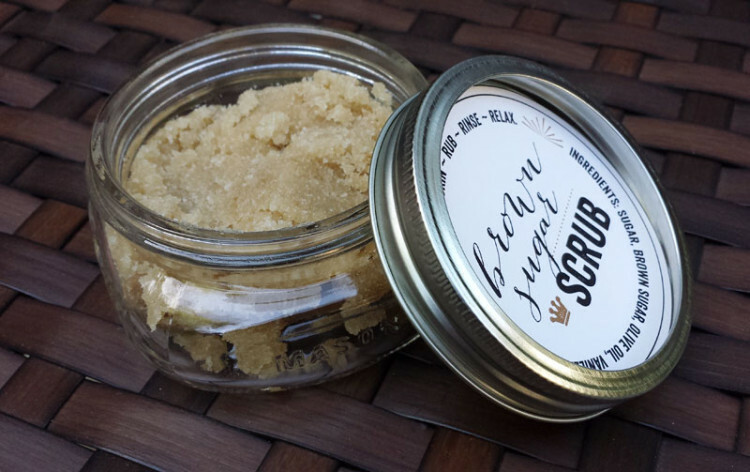 My favorite (and the most popular one at the party) was the Brown Sugar-Vanilla Body Scrub from Fiber Artsy & Craftsy. It smells good enough to eat (like cookie dough!) and contains just four ingredients, which you probably already have on hand. I added an extra cup of white sugar beyond what the recipe called for, because it seemed too moist at first. The recipe filled five of the 8-oz jars. I also made the Lemon Sugar Scrub from Hey Wanderer. With just three ingredients, this recipe is super-easy, too. The finished product didn’t seem quite lemony enough to me, so if I did it again I might use lemon essential oil instead of lemon extract. It made enough to fill six 8-oz jars. Overall I probably spent about $10 on ingredients making scrubs for 10 people – and I have sugar and olive oil left over. And I found these cute wide-mouth half-pint jars at Target for just over $1 per jar: Ball Wide-Mouth Half-Pint (8 oz) Jars with Lids. So at just over $2 per person, that’s a pretty easy and inexpensive give-away — and one that everyone seemed happy to get. NB – Since all the ingredients are technically food, these scrubs are pretty safe – but, of course, you are the best judge of what you should put on your skin, so use common sense. And do be careful with glass in the bathroom, for heaven’s sake. These labels are free for your personal, non-commercial use.